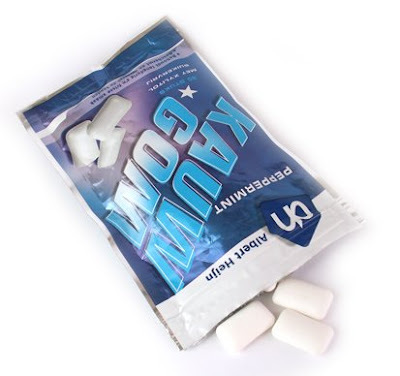 Since few years ago there have been a sudden increase in plastic packaging for chewing gums. Also a sudden increase of the amount of gums per package too. There are more than the packages than shown above, because there is also from Sportlife and Xylifresh which have both the same package company. But those design is quite odd compared with these, they actually provide extra paper in them to spit your gum into which make them quite expensive. The bright idea on these packages was that people would buy them to put in their cars, bags or at home, but not really for keeping it with you in your pants. Only the Mentos blast is one that is special made for keeping it in your pants. All these packages are made with the material PP / polypropylene, only the plastic bag is from other material but can't really find it. But the plastic bag design is not that new actually Airwaves and few other brands already used them for years. However all these new packages are made from recycled PP, but plastic isn't really that great for the environment. And also you are actually paying more for the packages than for the chewing gum with the PP made packaging. Because they cost all around 3 to 4 euro for a pack of chewing gum with 50 to 70 gums while the plastic bag packaging cost about 1 to 2 euro while you get from 30 to 50 gums. So why are these plastic packages made while allot of things are against the odds. They are mostly made to create a own identity so people recognize what brand the package is from a distance without seeing the logo's or names. Plastic are easily to mold into a shape that is different than others. We already know normal chewing gums packaging they all have an own identity in the packaging. Sportlife uses strips of chewing gums and Stimerol uses a paper wrapped around the chewing gums. So they want to set the trend further into the new packages. You can actually see the difference the Mentos is a cilinder shape, Stimerol a globe and Sportlife got a cube and tooth shape. However I think these are bit over the top, because chewing gums really don't need these kind of protection. It's like putting a plastic box around a potato chips and making it cost much more than normal while a simple bag is good in of. While Mentos and Stimerol use simple packaging for small packages using paper with a foil wrapped around them which doesn't really give much protection. But they are environmentally great because paper is easily biodegradable. So what is the best packaging or the ideal packaging. My ideal for a more sustainable packaging is that they would use the bag with a zipper closing design. However not using plastic for the bag but paper with a protective foil sprayed on the inside, like some of the paper potato chips bags. Or biodegradable plastic. And also they can make those bags in different shapes and different sizes. These packages will have a low cost plus a low pollution value.